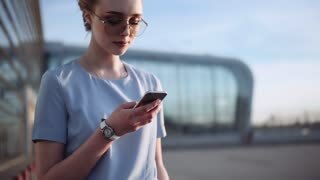 Rotation view of a bearded successful man using his phone by the airport entrance, sliding the screen, looking around. Stylish black suit, luxurious watch and sunglasses. Successful lifestyle. 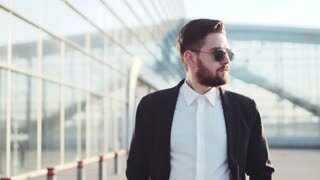 Handsome bearded man in stylish sunglasses sits in the business class car holding the phone, gets the message, smiles happily and respond to it. Successful lifestyle, luxurious look, corporate style. Handsome bearded Eastern businessman standing by the airport entrance, using his phone and smiles to received message, texts back. Stylish suit, sunglasses, elite watch. Successful lifestyle. Successful bearded man in sunglasses regulates the time via smart watch while walking by the airport terminal. Successful lifestyle, luxurious look, being a boss.